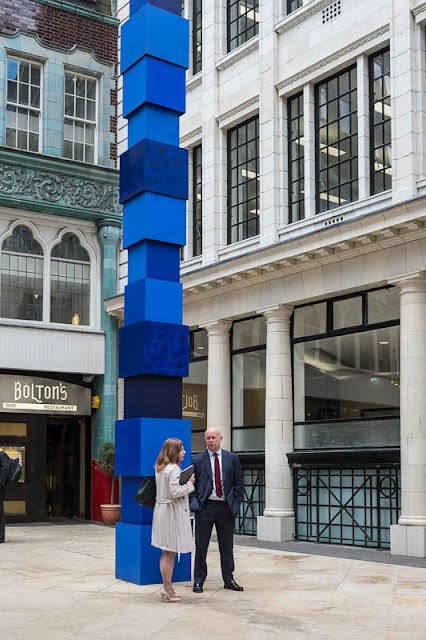 A stack of cubes by artist Jurgen Partenheimer, one of the art in the city art installations that surprise in the otherwise conservative square mile. Oh yes, this is very fun! I loved walking around this area the last time I was there. There were all kinds of interesting art pieces to admire, ponder and sometimes scratch my head in curious wonder. He must be very tall to have stacked them up like that! Ah, childhood revisited . . . Some beautiful details on the houses. Ooooh, I want to see that! I love the blue colour! How did you convince these two to pose there?